When Volkswagen engineers designed your vehicle, they had special tires in mind. Working with tire manufacturers, they created the optimal tires for your specific Volkswagen model. Volkswagen tires were designed to maintain the performance you deserve. Come see us at Donaldsons Volkswagen, and our certified technicians will install your Volkswagen approved tires today. Safety, quality, value, and performance. That's the Volkswagen way. Use our online tire store to search for recommended tires chosen specifically with your car in mind. If you drive a Volkswagen vehicle, simply enter the year, model, and trim of your car for a list of available tires at our dealership tire store in Sayville, NY. Driving something else? Not to worry. Simply enter your tire size which is in your car's owner manual or can be found on your current tires. 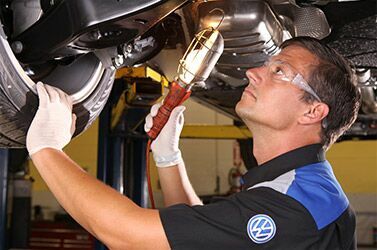 Where else in the Sayville area can you get fast, convenient service done by VW-Certified Technicians using Genuine Volkswagen OEM Parts at a competitive price? Certainly not those quick lube places. And there's no appointment necessary. It's probably easiest to purchase the factory original tires for your vehicle, as they were carefully selected by Volkswagen for performance, handling, and safety. If you are one of those people who hates having to buy new tires though, you may want to upgrade. Another reason to upgrade would be if you regularly drive in extreme weather or for longer periods of time, as that can heat up your tires considerably. Choosing the highest traction ratings can also provide peace of mind that your tires will stop quickly even on the wet Sayville area roads. The good news is that by regularly rotating your tires and keeping your tire pressure at the recommended levels, you can help to maintain their quality and extend tread life. If you've had your vehicle for a while, and/or are purchasing high quality tires, you may also want to get an alignment. This will aid in keeping you and your loved ones safer! If the tires are expensive, it can even maximize the value you receive, ultimately saving you money.